First off, I want to thank my gracious and kind host, Anna Dabrowska, for taking me in for four nights while I visited Krakow. All I had to do in exchange was take her gargantuan Labrador Retriever, Bronx, who’s size approaches that of a nuclear submarine, but with more speed and power, out for a run every morning. Bronx, despite having his own gravitational field, is super sweet, and wouldn’t harm a fly. The same does not necessarily apply to squirrels. Though he has never successfully captured one, Bronx, who speaks very good English, claims that a friend of his managed to once. My bet is that it’s just wishful thinking. The moment that a squirrel enters Bronxy’s field of vision, he breaks the chains of the leash like Superman snapping a twig, and my frantic command of “Stop!” obviously does not reach his otherwise totally obedient ears, because the speed of sound cannot catch up to him. So what happened on this fine day was that Lex Luthor the squirrel scrambles up a big oak tree, and Bronxy, nipping at his tail, manages to smash into the oak head first at 1,000 miles an hour, severely denting the oak with his dinosaur sized cranium. Meanwhile Lex Luthor and all his squirrel minions, rain down a hail of acorns upon Bronx as a token of appreciation for his efforts. This lasts for the entire .003 seconds it takes my pup to recover, owing to the fact that. 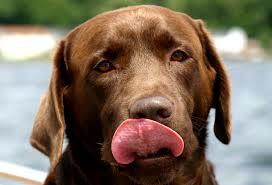 Labrador Retrievers have the genetic advantage of being immune to any further causes of brain damage. When I told Bronx this story, he adamantly denied it, slapping his paw on the ground for emphasis. Here’s a quick vignette of me and and Bronx, which ends with me starting to sprint away after the big lug scared the bejesus out of a poor, smaller dog in a Krakow park. Generally I tried to find areas with fewer trees. +1 this post! Forward it around, subscribe to and follow the blog! So funny! You really are a good writer!